Today, a treat for mental_floss readers: The world premiere of a short film featuring Jane Goodall, chimpanzee expert and conservationist. Produced by Quoted Studios, this is an animated version of an interview from the public radio show Science Friday with Ira Flatow, conducted on September 27, 2002. In the interview, Goodall discusses her book The Ten Trusts, her field work in Gombe, how she went for her Ph.D. without a B.A., and her opinion on Bigfoot—among other things. Ira Flatow: Now, I know you do wonderful chimp calls. Jane Goodall: Well I'm going to do the greeting. It's the kind of sound you'd hear if you went to Gombe and you climbed up onto the ridge in the morning and if you're lucky you hear the chimpanzee who's calling out saying, "Here I am. It's a wonderful day. Where are you?" Woohwoohwoohwhoooahahahah. Ira Flatow: Wow. That's great. 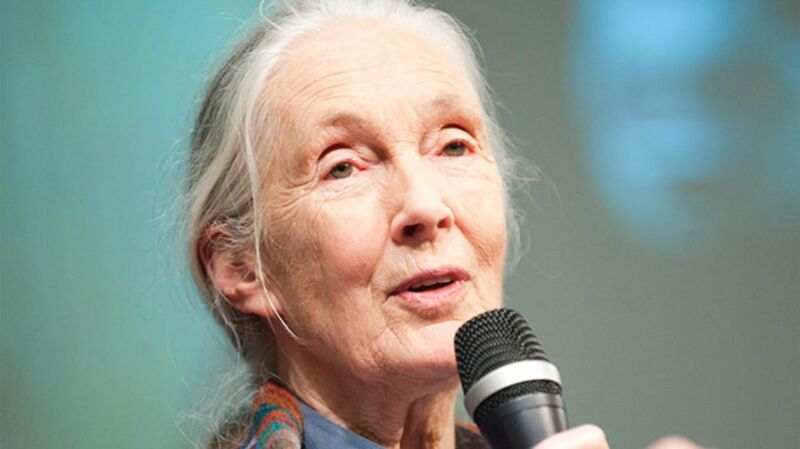 Jane Goodall: Each one has his or her own individual voice so you know exactly who's calling. Caller:	I wanted to know if you believed that there were any undiscovered, large ape species. Jane Goodall: You're talking about a yeti or Bigfoot or Sasquatch. Ira Flatow: Is that what's he's talking about? Ira Flatow: I'm out of the loop. Go ahead. Jane Goodall: Now you'll be amazed when I tell you that I'm sure that they exist. I've talked to so many Native Americans who have all described the same sounds, two who have seen them. There was a little tiny snippet in the newspaper just last week which says that British scientists have found what they believe to be a yeti hair and that the scientist in the Natural History Museum in London couldn't identify it as any known animal. Ira Flatow: Did you always have this belief that they existed? Jane Goodall: Well, I'm a romantic, so I always wanted them to exist. Jane Goodall: Animals were my passion from even before I could speak apparently. Then when I was about 10, 11, I found the books about Tarzan of the Apes. Fell in love with Tarzan. He's got that wife Jane, so I was terribly jealous of her. That was when my dream started. When I grew up, I would go to Africa, live with animals and write books about them. That's how it all began. Jane Goodall: I got the opportunity when a school friend invited me to go and stay on their farm in Kenya. I was 23 and I sort of said bye-bye to family, friends and country and off I went. That's when I heard about the late Louis Leakey and somebody said, "Jane if you're interested in animals, you must meet Louis." Louis realized that I was the sort of person he said he had been looking for for about ten years who didn't care about hairdressing and clothes and parties and boyfriends. I really wanted to be in the wild. Jane Goodall: It took him a year. He searched for money and eventually found a wealthy American businessman that said, "Okay Louis here you are. Here's enough money for six months. We'll see how she does." The chimpanzees ran away as soon as they saw me. They had not seen a white ape before and I knew if that six months money ran out before I had seen something really exciting everyone would have ... I would have let Louis down. Jane Goodall:	David Greybeard, bless his heart, I saw him crouched over a termite mound. The whole thing putting in the grass, picking the termites up, picking up a leafy twig and stripping off the leaves which is the beginning of tool making. I couldn't actually believe it. I had to see it about four times before I let Louis Leakey know and then I sent a telegram and he sent back his famous, “Ha ha now we must redefine man, redefine tool or accept chimpanzees as humans." Jane Goodall: After a bit Louis said, "Jane you have to get a degree because otherwise you can't get your own money and I won't always be around to get money for you." But he said, "we don't have time to mess about with a BA so you'll have to go straight for a Ph.D." He managed to persuade Cambridge in England to accept me as a Ph.D. student. When I got there, it was actually a very unpleasant and hostile reception that I had. I shouldn't have named the chimps. It wasn't scientific. I didn't know. I knew nothing. And worst sin of all was that I was ascribing to them emotions like happiness, sadness and so forth. Ira Flatow: They were just aghast at you? Jane Goodall: Yeah they were. Caller: Do you think a primatologist's gender influences how they conduct their work? Jane Goodall: Well I think in many cases it actually does. Louis Leakey always thought women were better as observers. He felt that they were more patient. Certainly it's very often true that women tend to be a bit quieter and more prepared to sit there and let the animal tell you things. Ira Flatow: Would you rather be remembered for discovering the tool making abilities of the chimps or for your work in the environment today? Jane Goodall: I think I'd like to be remembered as someone who really helped people to have a little humility and realize that we are part of the animal kingdom not separated from it. When I do go back to Gombe it’s to be in that timeless world where it's soft and where life is entwined and you actually see the pattern of nature. I always feel this great spiritual power which I believe is around. This is the second installment in a three-part series; for the first video, see Buckminster Fuller on The Geodesic Life. We'll have the final video next week, featuring Richard Feynman (! ).